"Now when I take my woman out, she's happy to see me in my "button" down shirt. Makes her feel like I care enough about her to get dressed up. And I DO CARE about her, she's my woman. It's just that until now I never felt comfortable wearing what every one else was wearing. I'm just an average guy who loves football and hates to get dressed up. If that's how you are, you'll like your shirt as much as I like mine, maybe even more. Get one now and see what I mean." "I also want to tell you, if you need pepper spray or a stun gun, go to my web site, theselfdeenseguy.com, and you can get pepper spray or a stun gun for only $2." 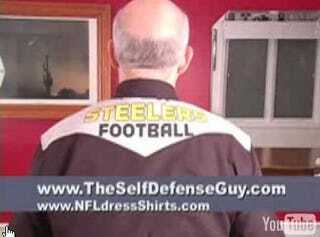 So you may look hideous in this atrocious NFL dress shirt, but at least you'll be armed. And let me tell you, there is no peace of mind like the peace of mind you'll get from knowing that you have a two-dollar stun gun in your purse. Combine these with my bulletproof briefcase, and I'm virtually unstoppable on any business trip.